Champagne, champagne, champagne as far as the eye can see. i.e my kind of party! One of my favourite brands: Veuve Clicquot, hosted their kick-off to Summer party on Friday 10 May, 2013 (originally slated for April 26th, the party was postponed due to inclement weather and nearly faced another wash out on May 10th). 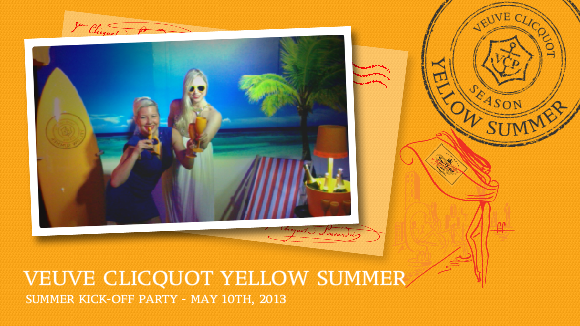 The “Yellow Summer” themed party was held outdoors, Poolside at the Grand Hyatt. The space was transformed into a lush urban beach, with ubiquitous yellow Veuve branding on all sorts of Summer paraphernalia: wake-boards, surfboards, sunglasses, beach towels.. you name it! Following a dress code of “barefoot and black tie,” guests were welcomed with an abundance of free flow Veuve at the spectacular venue of yellow sun shades and cabanas, regaled by paddle boarders and lounging models, all against a backdrop of Hong Kong’s iconic skyscrapers. As always it was great having an event on a Friday night and aside from the wet ground from that afternoon’s downpour, making long black tie dresses a bit uncomfortable, this event was faultless. Special shout out to Lee Wolter for arranging such a smooth running event, especially in the face of one postponement and quite nearly another one. The goody bags were also to die-for, with a bottle of Veuve Clicquot, a full Benefit make up palette, Veuve leather luggage tag, sunglasses and fan. Despite the weather the party really put you in the mood for Summer! This entry was posted in Food, Parties and tagged Grand Hyatt, Grand Hyatt Poolside, Lee Wolter, Veuve Clicquot. Bookmark the permalink.